Hello I'm Dr. Roderick H. Sorensen and I have been practicing chiropractic for 25 years. As a veteran chiropractor, I love helping people back to better health. There's nothing like hearing someone say , "I no longer need to take a bottle of pills for my migraine headaches!". I continue to treat children and adults of all ages from infants to 99 years of age. Whether you need a gentle adjustment to guide your spine to healing or a bone cracking move that will force your body to feel better now, I am ready to help you get back into motion! Here is my story. I moved to Chowchilla, CA from Oregon at the age 10. I graduated from Chowchilla and immediately started an accelerated curriculum at Fresno State University. Then, I spent 3 straight years of intense study to obtain my Doctorate of Chiropractic from Palmer College of Chiropractic-West San Jose, CA. I enjoyed living in the bay area but after graduating in 1993 I decided to move back to the central valley to work as an associate chiropractor at Molthen-Krikorian Chiropractic. I enjoyed learning and building my practice along side the business minded Dr. Krikorian and Dr. Molthen with 35 years experience. A short time after I started working there one of the Dr.'s injured his back. (yes, even chiropractors get hurt.) I immediately took over as the clinic chiropractor. The office grew quickly with the help of a very trained staff. I was soon treating up to and over 100 patients per day. The complexity of cases and serious injuries gave me a vast experience in a relatively short time. After 12 years of working in a high volume practice my desire to go on my own began to take form. One day in May of 2007 while working late , I said a prayer, God... I'll retire here unless you throw something on my lap." 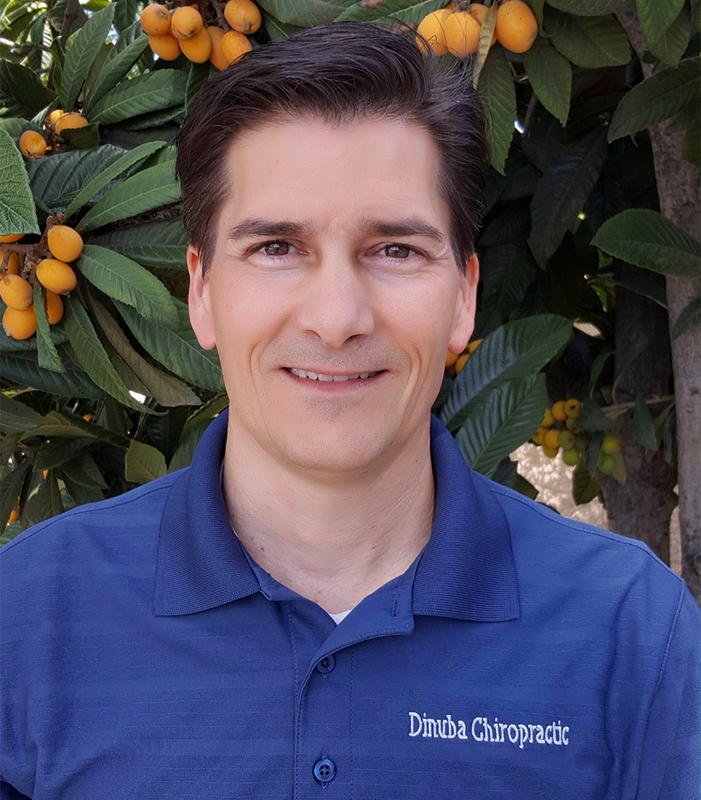 Upon getting home an hour later, my wife told me that a high school friend from Dinuba called to let her know that Dr. McGee at Dinuba Chiropractic was selling his practice and retiring. God literally threw something in my lap! Six weeks later in June of 2007 I began commuting to Dinuba from my home in Clovis to Dinuba Chiropractic. I immediately had a desire to give back to the community that had so openly welcomed me and where my wife was raised. I joined Chamber of Commerce and Dinuba Rotary in 2007. I was president of Dinuba Rotary from 2013-2014, during which we worked with the community and Dinuba High School to raise $7000.00 in scholarship's through a Golf Putt and Raffle at every Dinuba football home game. In order to become even closer to the community we purchased the property on which the office and house stand. Three years of careful restoring was done to the 1907 historic home (The Nichols House). My family and I reside at the residence and my commute is now a walk across the driveway, rather than 45min.! We look forward to being a part of this community and getting to know you.